In my recent articles about zinc treatments for the common cold (in March and May), I expressed skepticism that zinc has any effect on the duration of colds. The maker of Cold-EEZE, ProPhase Labs (PRPH), sent me a detailed response from their Chairman and CEO, which I'm posting here for my readers. Because the document is rather long, I've only included a portion of it below, with my commentary interspersed. The full text, with references, can be found here. Now on to the response. The following information will provide a clearer picture as to what the Common cold is and how it progresses in your body. Also discussed is how certain zinc formulations are clinically proven to reduce the severity of cold symptoms and the duration of the common cold by nearly half. Finally, we provide some clarity as to why some zinc formulations are more effective than others, and thus, some studies on zinc formulations demonstrate significant efficacy while other studies fail to do so. We would like to start by correcting some misinformation in your article. 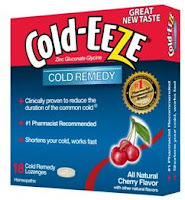 Contrary to your claim, ProPhase Labs, Inc. (former The Quigley Corp.) did not sponsor the two clinical studies supporting the effectiveness of Cold-EEZE zinc lozenges. ProPhase Labs, Inc. only provided the zinc gluconate lozenges for these studies. The first study at The Dartmouth College was sponsored by Godfrey Science & Design, Inc., Huntingdon Valley, PA and by a grant from the Rorer Pharmaceutical Corp., Fort Washington, PA. The second study conducted by Cleveland Institute was granted by the General Pediatrics Research Fund and the Departments of Infectious Diseases and General Pediatrics of the Cleveland Clinic Foundation. Another criticism in your article related to the fact that some of the clinical studies had been conducted 10 to 20 years ago and that the results from these studies were therefore no longer valid. This is simply not a valid conclusion. The science to conduct such studies, the metrics to measure the response, and the statistical tools utilized for analyzing the results has not been modified or changed significantly during this time. One should bear in mind that there are plenty of drug products on the market today which are approved by FDA based on clinical studies conducted more than 20-30 years ago. "… their website points to three studies from 10-20 years ago. They conveniently ignore the more recent studies that showed far less (possibly no) benefit." The zinc ion, based on its specific property and electrical charge, has an affinity for a specific intracellular adhesion molecule called ICAM-1 receptor present in the nasal epithelium cells. The Zinc ion has an ability to form a complex with the receptor and thereby prevent the binding of the Rhinovirus to nasal epithelial cells. The Zinc ion has an ability to prevent the formation of viral capsid proteins and thereby inhibits the replication of several viruses, including Rhinovirus. There are several peer reviewed scientific publications which provide a better understanding regarding the effect of Zinc on the common cold caused by Rhinovirus and the possible mechanism of actions to inhibit the progress of Rhinovirus infection. [COMMENT: the makers of Cold-Eeze point to a list of 9 "peer reviewed" papers that they say support their point. Few of us (certainly not me) have time to read all these papers, but I did look at them briefly. Two papers are in the journal Medical Hypotheses, which is not only not peer reviewed, but is well known as a trash bin full of crank theories without any scientific support or plausibility. See the excellent discussion by Photon in the Darkness about why Medical Hypotheses is a bogus source. The inconsistency in the clinical results between different studies may be explained by the fact that: (i) the type of virus causing the common cold may have varied in each study and; (ii) the type of zinc formulation that was studied also varied. Different formulations use different types of additives such as flavoring agents and sugars which are commonly used to help improve the palatability of the zinc ions. In some formulations, these additives form highly bound complexes with the zinc ions. This results in poor ionic zinc availability. Given the link between ionic zinc availability and prevention of cold virus replication, it is only logical that decreased ionic Zinc availability may lead to decreased efficacy observed in some particular clinical studies. Effective delivery of the Zinc ions in the oral cavity is critical to the success of zinc formulations reducing the duration of the common cold caused by rhinovirus. There are many forms of Zinc supplements which do not release the Zinc ions in the oral cavity. This is likely to be a major reason for the inconsistent results in some zinc studies. Based on the strong, statistically significant results obtained from the two double blinded, randomized, placebo controlled studies conducted by Cleveland Institute and The Dartmouth College, we are convinced that our Cold-EEZE product releases and effectively delivers the right amount of Zinc ions in the oral cavity to fight the Common Cold caused by rhinoviruses. Furthermore, two other studies were conducted by the Heritage School in which teenage students were provided with one Cold-EEZE lozenge daily. The reduction in the number of instances of upper respiratory infections was dramatic. Moreover, for those students who did catch a cold, the duration was reduced significantly relative to the prior year. Unfortunately, these were not placebo controlled studies so our technical conclusions are a bit more limited but the results are highly convincing and supportive of the other two statistically significant studies that we refer to. Finally, we include an insert in every package of Cold-EEZE, asking consumers for feedback. Well over 90% of consumer feedback is directly positive toward efficacy and incredibly, only approximately 1% is negative regarding efficacy. (The rest of the consumer feedback primarily relates to packaging and flavor comments and suggestions.) These real life results in the field powerfully confirm the supportive clinical studies. An understanding of the different zinc formulations including their zinc ion availability and delivery is critical to drawing the appropriate conclusions with regard to zinc efficacy. 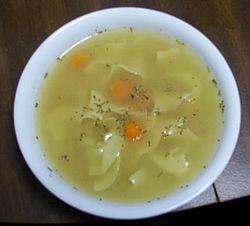 Our intention in this response has not been to undermine the nutritional value of chicken soup which most probably has a complimentary function in shortening the duration of the common cold.